I made this quilt and pattern a couple of months ago for the November issue of Love Patchwork and Quilting Magazine. I wanted something that felt a bit Christmas-y without using red and green…so I used different shades of aqua and teal with a few grays thrown in for variety. This backing and binding fabric are from Joann’s, by Patty Young. 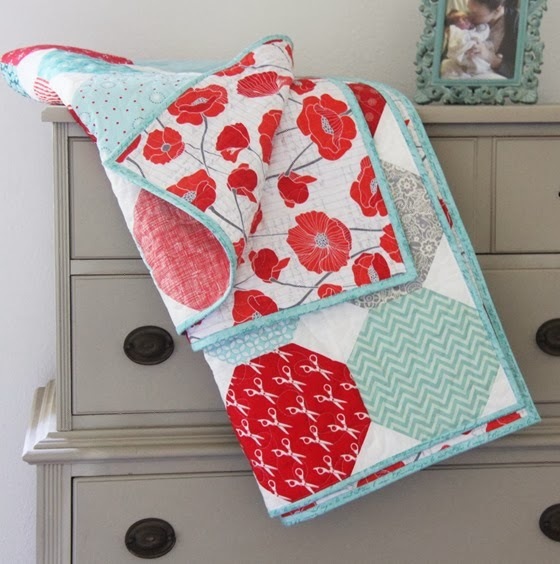 I love a bold backing to match a simple quilt front and this print is beautiful! In case you forgot there are only 21 days until Christmas…21 days!!! Well, I LIKE this snowball quilt. I usually don't–the white contrast bothers me or something. Now I need to go look at others and see how this is different. Maybe the octagons? It's beautiful and can't wait for that issue to be available here! I miss those times with the children now that mine are grown. I am hoping that soon I can start baking and crafting with my grandchildren but I am enjoying sewing a few gifts for them this year. Love the snowball quilt. Love the aqua and red combo, very fresh and can take you into spring with the poppies on the reverse. These are my Christmas colours this year and I would love that quilt to adorn my couch. That quilt is stunning. The fabric for the back is so perfect–the big flower about the same size as the red snowballs. I like the idea of Christmasy without being in your face. I love this quilt. The backing fabric is amazing too – wish I lived near a Joanns! Beautiful quilt! Someday I will try making for my family. This is gorgeous, I love the aqua instead of a more traditional green. Fresher! I love that aqua and red combination, it's like Christmas but with icing – just gorgeous! This quilt is great! 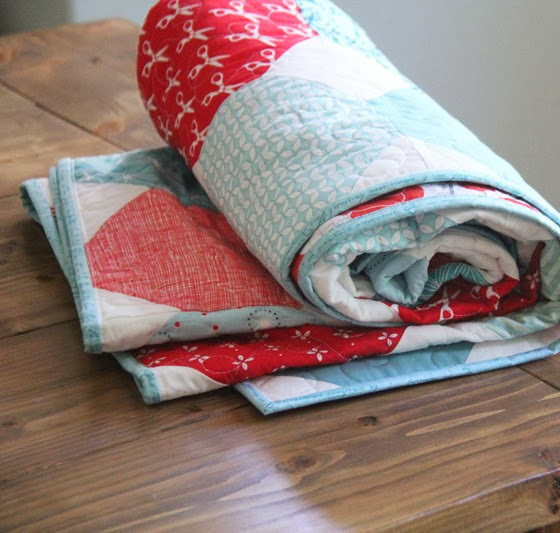 I love that color combo, it's accessible to non-Christmas celebrators, and also year-round quiltmaking! I love that quilt…Tried to find the issue. Is it only available in UK? I work about 80 hours a week and have totally missed it!. WIll it be in your shop? I do like that magazine and will have to watch B&N for it. I'm sure going to miss all the hoopla with the holidays since we just moved to Arizona, maybe next year. Totally loving the colours you chose. Very soft yet with a pop contrasted with the white. Awesome. A very cheery quilt. I really like your choice of colors and patterns. And that backing is a perfect addition. Love this. This is AWESOME! Love it. Will you eventually release the pattern in your store too? It is different than the other snowball quilts which makes it unique and I really like this. And its not a pattern that is in the U.S. I love your Christmas fabric, much nicer than green and red. Thanks for sharing! That print is super super cute and I didn't know Carina designed fabric at Joanns. Nice. I will have to check it out sometime :) Very Very cute Quilt Allison! I'll be your friend too, lol. 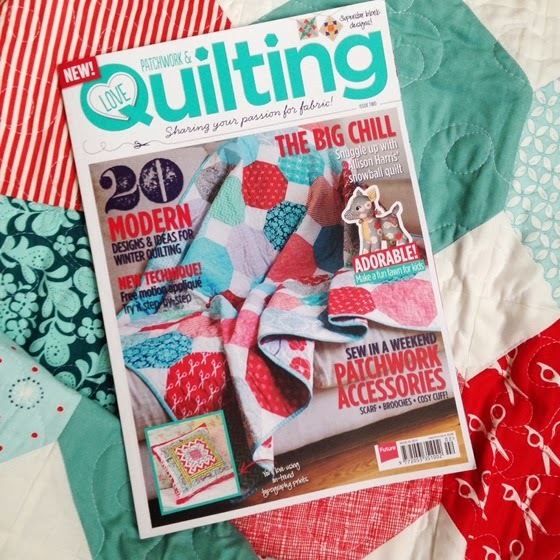 What a beautiful quilt, I'm going to run out and try and buy this magazine for the pattern. Love your colours. Enjoy your children they grow up sooooo fast! Make good memories! 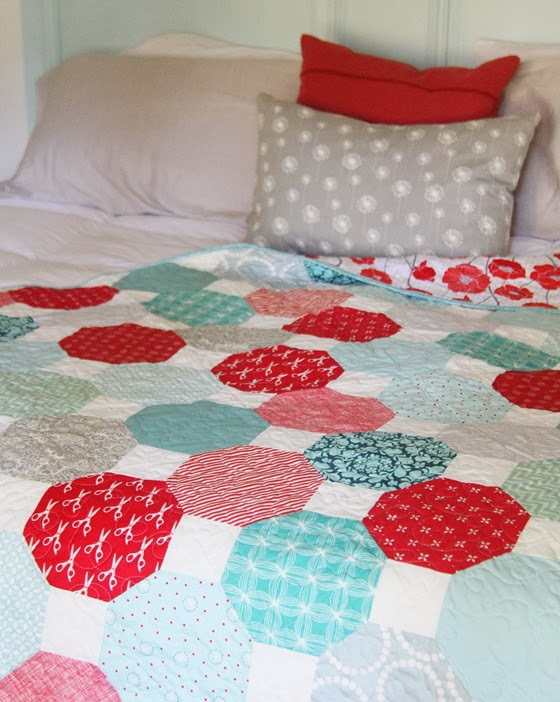 Such a cute pattern and beautiful quilt! I am currently working on a quilt in those colors for our master bedroom. So fun! Fantastica la manta. No sé donde compras las telas pero estoy enamorada de ellas, son preciosas y me gusta mucho como las convinas. I really like the colors of this quilt. I went in search of the poppy backing fabric and even contact Carina Gardner. She was kind enough to personally respond that the poppy backing fabric is actually that of Patty Young, Modkids, line done exclusively for JoAnn fabrics. It is the Rendezvous line. I just wanted to share that I really enjoy your quilt projects and to share the info I found out about the fabric. Allison…. Happy New Year! Do you have any clue where I can purchase issue 2 of this mag? I just got my first issue and it's issue 3… I would really like to get the issue you worked on. I'm having a problem finding it.